Join the discussion on our forums! 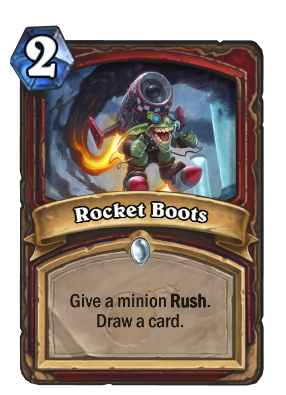 Come discuss Rocket Boots over in our dedicated Rocket Boots discussion topic. Obviously giving a minion Rush has a lot fewer applications than Divine Shield, but the reminds me a lot of Potion of Heroism which is a pretty good card. Its probably still too expensive for most Warrior Decks because to take advantage of the Rush it basically makes one of your minions cost 2 more mana, but it might be okay in Recruit Warrior. Early game you can cast it on an enemy minion to draw a card or you could play it on something you pull out with Woecleaver for more immediate impact. Charge with draw a card added on, OK.
Wow, that's really okay! Rush on Magnetic is worth 1 mana with skate minion, 1 card for additional crystal, balanced!